Yesterday afternoon I had a blast filling in for my over-scheduled friend Susan Williams over at Atomic Learning as I facilitated a discussion as part of her blended learning course she is teaching called "Going Mobile." At about 4:30 I got home from teaching and logged into their Adobe Connect account and prepared things on my end as I waited for the educators to join our online discussion. I got things started by reviewing what they had been learning this past week which turned out to be the SAMR Model, something I ramble on about all the time. Many of them were familiar with the logic behind this model for tech integration, but there needed to be some clarification on how to apply it to lesson planning. I had some in-the-trenches stories to help explain the levels. They then shared how the SAMR Model was applicable to their classroom situations. Since this next week the participants would be reviewing my Atomic Learning course on authentic assessment using iPads, I took the remainder of the hour to tell them about some of the iPad projects I had been working on since I made the assessment course last June. 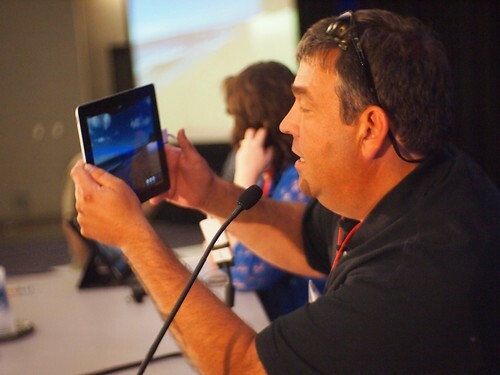 It is fun to be connected virtually with other educators and share ideas about the exciting reformation of education - some of what is driving this is the use of mobile technologies like the iPad. It is like all of us educational heretics are starting to unite and organize. We are going forward, and there is no stopping us -- the status-quo of education is not enough for this type of educators. They are hungry for more and courses like Going Mobile is feeding their appetite for direction and information. So unless you have been living under a rock (cue old GEICO ad), if you're an educator then you've been hearing a lot of fuss over the adoption of the Common Core Standards, and if you're connected to technology like myself, then you have been waiting for today for the launch of the yet un-named iPad Mini. But what on earth do the two have in common? 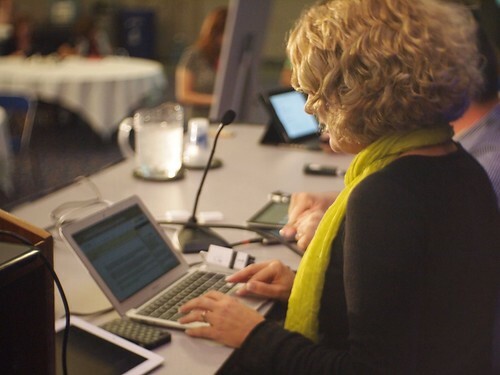 This morning I started my daily churn of the edtech news by reading about Atomic Learning's new program for addressing tech components of the Common Core standards. Which comes on the heals of an article I read in Edudemic magazine on the same subject. Now you combine this with the news that Apple's introduction of the much-rumored iPad Mini press event today will focus on this new iPad and education then you might have some connections. 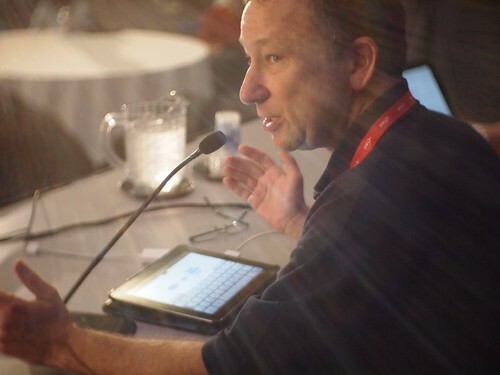 Although I believe that much of the iPad Mini and education connection today will focus on iBooks and pricing, I am holding on to the hope that the iPad Mini will be a great publishing tool, much like it's bigger brother. You see, much to do to with Common Core standards and technology centers around students being able to publish their writings, through blogs, wikis, podcasts and such. But I also hope that today we see some changes with the iBooks Author. For example, I hope that students can publish directly from their iPads and not need to use a computer like with the current iBooks Author. Come on Apple let's publish iBooks from our iPads, computers are so pre-iPads. So with fingers crossed and my breath held, I wait for today's Apple event. How to make a student iPad podcasting studio. iPad number 1: Sound Effects. The host of each episode has this iPad his/her desk in the studio, this iPad used the Soundboard app from Ambrosia for all of the different sound effects that we use to make a show; laughter, applause, ohh-ahhh, etc. Before converting to iPads, the sound effect were handled by a different students, which often led to some mis-timed sound effects, now that the host Han control his/her own sound effects, the show is much better. iPad number 2: Music. Before each show we play about 10 minutes of music while students come into their classrooms, this allows teachers to adjust the volume of the show. We mostly play Kidz Bop songs from the Music app since the lyrics have been scrubbed clean for our young audience. iPad number 3: AudioBoo. We connect our sound mixer's USB cable into the bottom of this iPad through the Camera Connection Kit. Each show is recorded into the AudioBoo app and then we add album art and upload to our AudioBoo account which is then picked up by iTunes within an hour. AudioBoo also sends out a Tweet using our school's Twitter account. The drive today from my house in Northern Colorado to Wichita, KS for Podstock is 9 hours. Which has given me a lot of time to think. 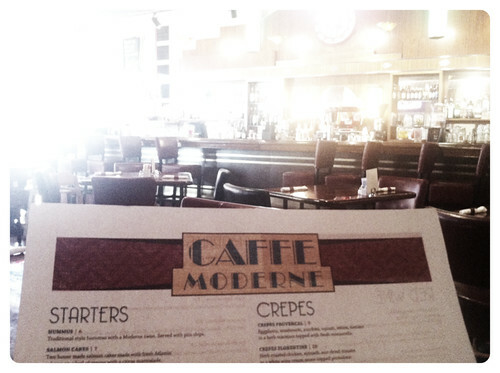 I am finally in Old Town, Wichita at the tasty restaurant Cafe Moderne taking advantage of both their incredible menu and their free WiFi. 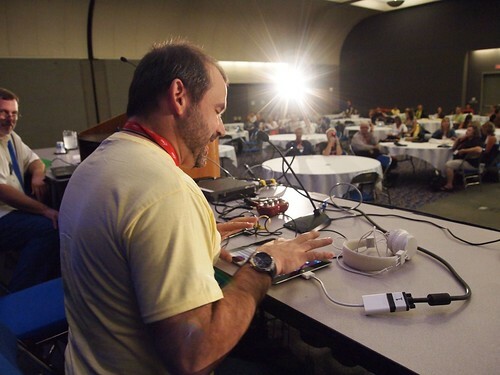 You see, this Thursday I give the opening keynote for Podstock, which has caused me to rehearse it over and over again in my head during the drive out here. I am sure that the people on the interstate with me thought I was nuts talking to myself as I cruised across the pains of Colorado and Kansas. 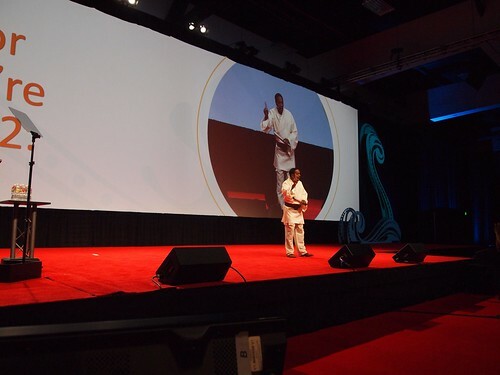 In this keynote I am giving is totally new information that I have not shared before. Some of the ideas I am presenting are things that I have been working on for years. I am going to finally share some of the secrets that I have been using to get my students to do amazing edtech projects like movies and podcasts. I have been reluctant to share these ideas in the past because many of them were unproven - and maybe just a flash-in-the-pan - and not a sustainable program. I have also struggled with how to articulate these ideas into something that is easy for other teachers to replicate without being just another "program." I am happy to report that everything has come together for me in the past 90 days. I finally have such a large body of evidence that supports my ideas and beliefs, that I now have all the missing pieces in place. I even got a few new insights as the corn fields passed by - who knew that corn fields could be so inspirational? This was the year about mobile computing or BYOD. Although we talked a lot about mobile computing and BYOD(in theory) last year, this year we seemed to now know what to do about it. There we're tons of sessions dedicated to this topic, with many success stories to be shared and duplicated. There was also a lot of informal discussions about edupreneurs (educators who are entrepreneurs). I never knew this crowd even existed until this year. And when I say informal discussions, I mean what people are talking about at lunch and in the hallways between sessions. 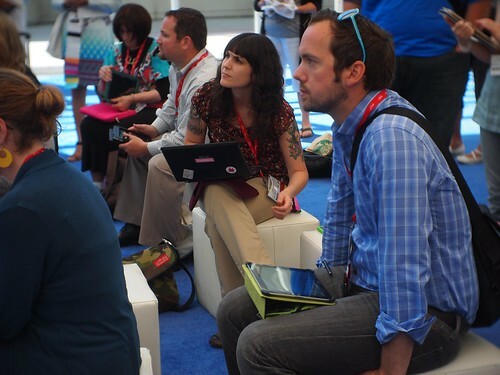 This was one of the most positive years as far as the vibe among edtech educators. I don't thing we feel as beat up as in years past - I think we are finally coming into our own. And we are a force to be reckoned with. 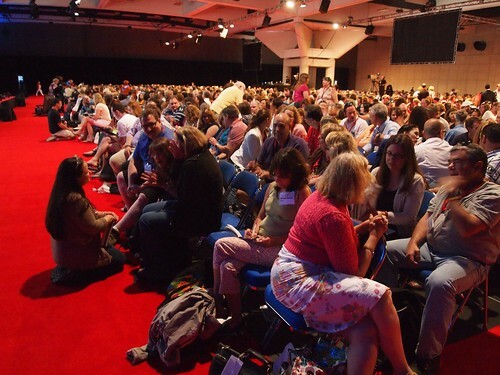 Most of us are turning into our own advocates for change - I think we feel not so alone after attending this ISTE. I just checked my idea list from this year and there are 42 items on it, and over the coming weeks I will narrow it down to about 4 or 5 things I will try in my school with my students, but it is these ideas that are going to change things, these are the big things. 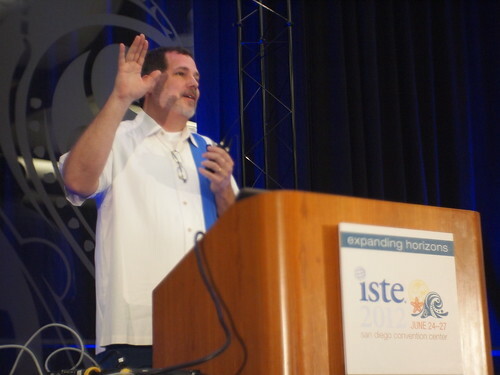 Thank you ISTE for another great year - well done and I can't wait until next year. Watch out Texas, here we come! 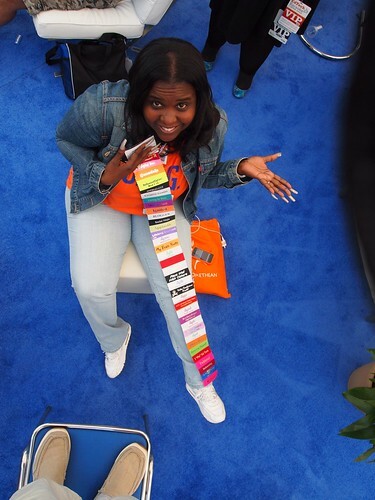 When ISTE Convention Ribbons Go Too Far! 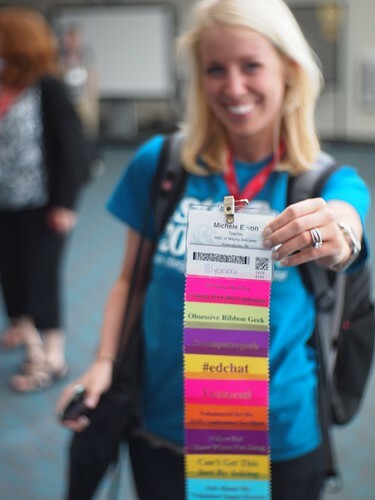 So I'm sitting in the ISTE 2012 Blogger Cafe when I see an educator with convention ribbons gone wild. She claims that she wears each one legitimately. Tweet ups gives all of us who follow each other virtually on Twitter a chance to meet face to face in the real world, something that I find a bit awkward to tell you the truth. Online is one thing, but in the real world it can be a bit difficult to measure up. 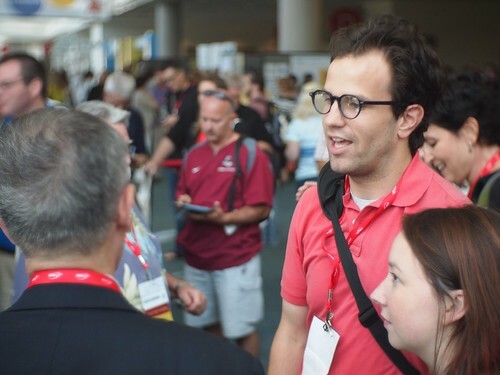 This year's ISTE Tweet Up started slow but then grew quickly with educators offering the normal "Great to finally meet you in person." salutations. 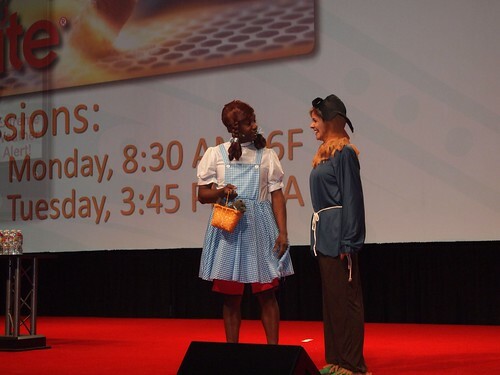 The ISTE annual edtech conference kicked off with a member celebration as the hosts took us through different superheroes and partners through history and spun each duo to how they would be if they met at ISTE. Here are some photos from the event. Six years old and still going strong. 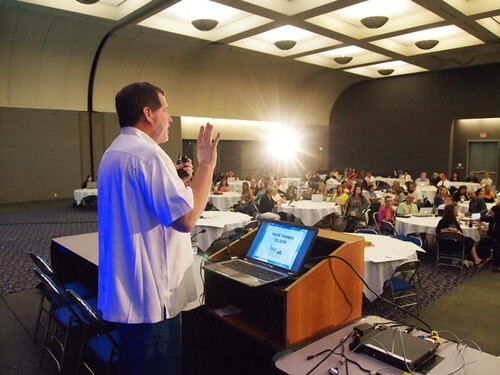 This year's SocialEdCon is the biggest to date, even with the name change for Edubloggercon. 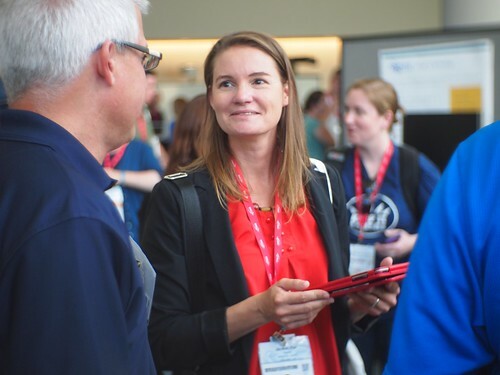 The event happens each year before the ISTE conference starts, giving the educators who are big into cutting edge edtech a chance to get together and share ideas in an unconference format. Here are some photos from this afternoon. 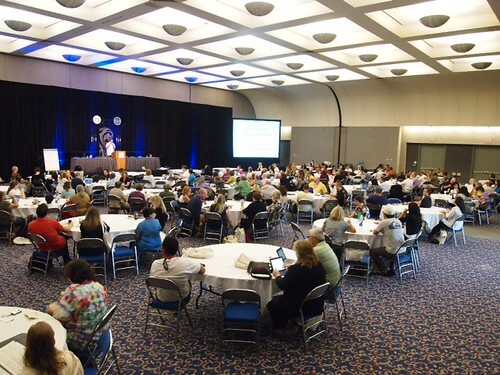 We have just started this year's SocialEdCon which used to be called EduBloggerCon. Great crowd, great ideas for discussion for this year's unconference. I am getting ready to attend the Colorado TechFair this Saturday where I will be showing off the animations my students make during the animation breakout session. I have been testing the new animation software Frames 5 by Tech4Learning and I have some new techniques demonstrate. 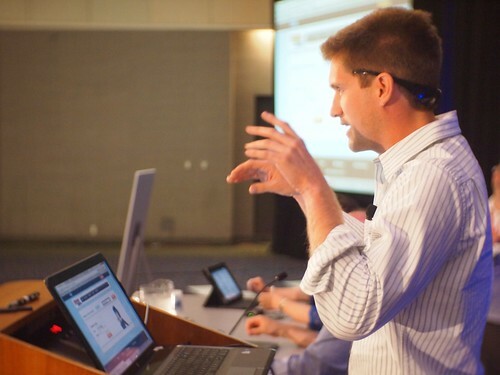 Colorado TechFair is a one-day event that will be held on Saturday, May 12, 2012 from 10am to 2:30pm at the University of Denver’s Fritz Knoebel School of Hospitality Management. The TechFair will feature approximately 40 projects created by 1st-8th grade students from Colorado as well as other fun activities, such as a Lego-robotics lab, a Scratch computer software lab, a graphic design work exhibit, and an animation breakout session. Admission is free. 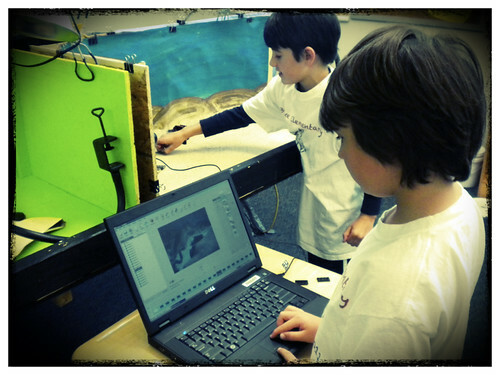 It will be a fantastic day for students of all ages to engage in hands-on, minds-on activities, such as Robotics, Game Design, Computer Programming, Graphic Design, Animation and much, much more. Categories for competition include: programming, robotics, graphic design, animation, game design. By challenging each student to excel within this competition we are creating new and exciting opportunities that can benefit them for years to come. Yesterday we finished another two scenes of our new movie The Ghost of Bethke. 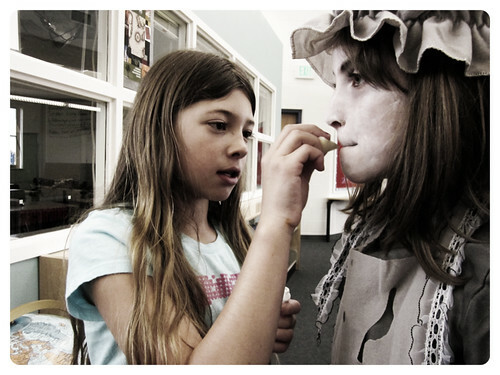 I was surprised at how well the students did the makeup for the ghost. Filming and editing on the new iPad is a breeze. - the new grant I am writing to get new "learning spaces"
Are you dreading implantation of your organization’s latest technology updates? There may be help for you in the book “Crossing the Chasm” by Geoffrey A. Moore. The book is intended for organizations that market and sell “disruptive” products to mainstream customers. While your organization may not be selling in a traditional sense, advice from experts may be the key to get your team onboard with a new technology implementation. What does it mean to cross the chasm? The theory indicates there are several different types of people when it comes to technology adoption. Innovators and Early Adopters embrace change. In the bell curve of technology adoption, there is then a chasm. This is the home of failed technology implementations. If the chasm can be crossed, the remaining characters on the technology adoption life cycle will accept technology change. I downloaded the book to my Kindle app on my iPad and started to read it while waiting for my flight to board. By the time my section was called I was already mad. I was mad about this book because I could have used this information years ago!